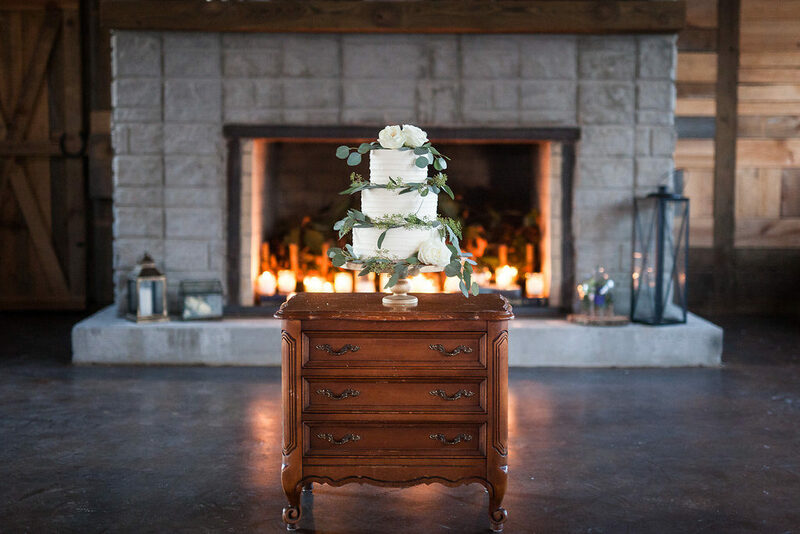 Organization is one of the most important things during the wedding planning process. As a bride, you’re dealing with multiple vendors, timelines, payments, and approvals. If you haven’t heard about the email address wedding hack, get ready to say hello to streamlining all the things and goodbye to stress! 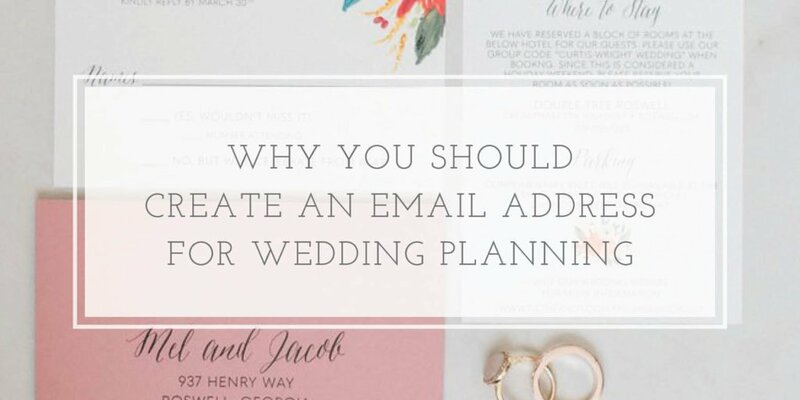 I’ve noticed many of my clients have a dedicated email address and it really got me thinking – what are the perks to setting up a brand new email account specific for all communication related to wedding planning? 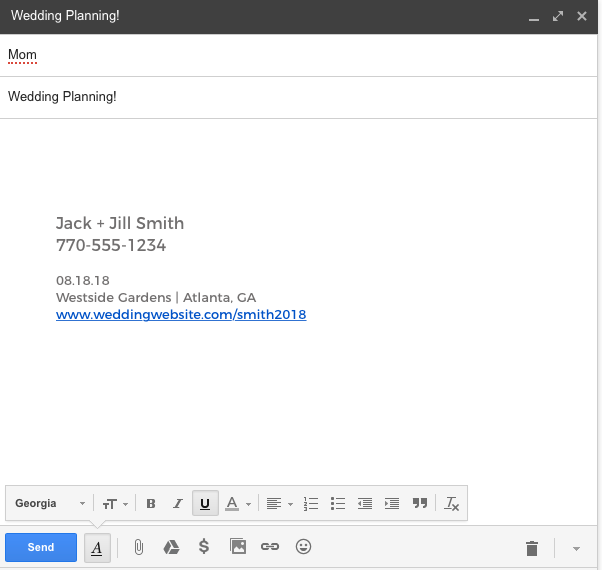 With a wedding planning email address, you can make sure all related things end up in one place. Everything stays nicely organized and makes responding much easier. It’s also a good idea because you’re quickly able to go back and review messages and contracts without digging through a huge inbox. 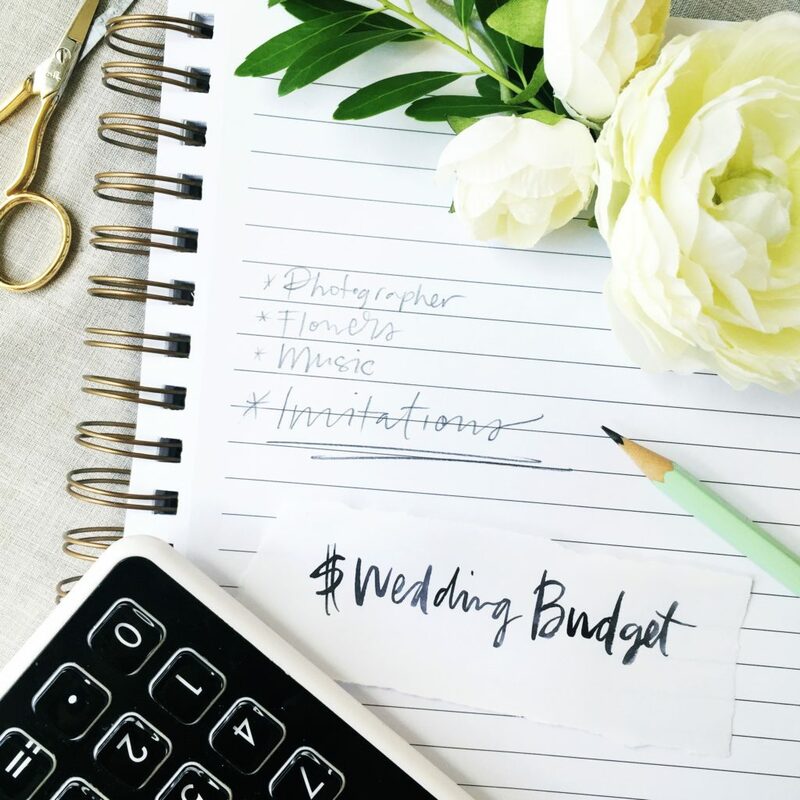 When you’re wedding planning, it’s likely that you’ll be communicating with several vendors – your venue coordinator, a wedding planner, the photographer, your florist, the caterers, transportation and hotel contacts, your designer… the list goes on! 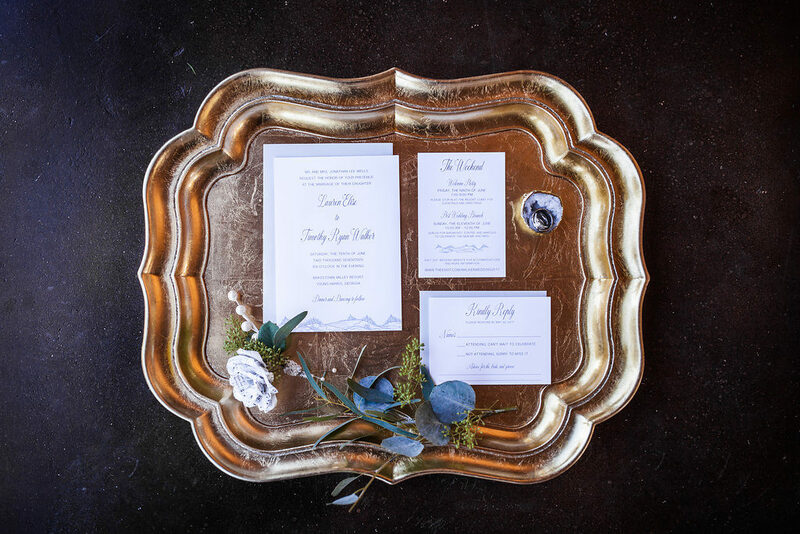 Not only is this a great place to keep all correspondence with your wedding vendors, but also anyone else involved in your planning – parents, friends, etc. Give them the email address and instruct that anything wedding related (reminders, suggestions, information) be sent to that account. You can also include the email information on your wedding website as contact information for guests who need to get in touch with you. Only check your emails when you’re in planning mode. 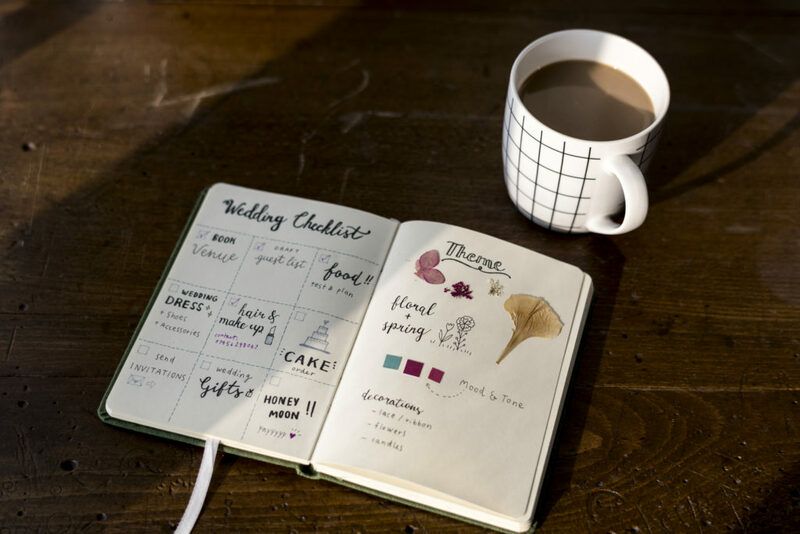 This can be a time saver and allow you to batch your wedding planning tasks. If you’re feeling stressed or just need a break, turn off the notifications and pause planning until you’re feeling excited again! Give your fiance access to the wedding email address so that he can be involved in the planning as well. For the email address itself, include your names (or future last name) somewhere so it’s easy to identify for vendors. I’ve seen lots of variations, so feel free to get creative! Create a signature that will be included with any message. Make sure it clearly lists both your names and a phone number. It can also be helpful to have the wedding date, venue name, email address to your planner, and a link to your wedding website. 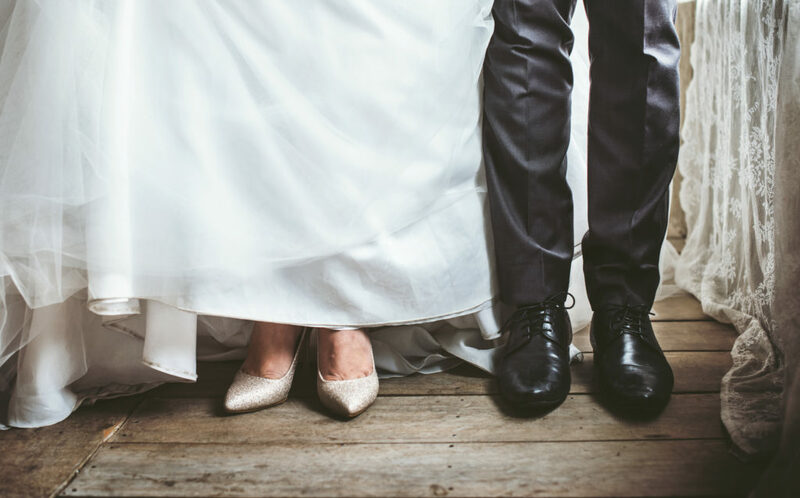 The only downside: Once the big day is over, you’ll likely stop checking the email which could mean you’ll miss communication from vendors that want to reach out post-wedding. For example, I send all my couples an email at the end of the year offering specials on newlywed holiday cards. I know a lot of other vendors also offer discounts and sales to previous clients, often communicated through email. Avoid this by quickly sending a single email, copying in all vendors, to let them know your best contact email after the wedding. BONUS: Need some help staying on task and managing your wedding planning? 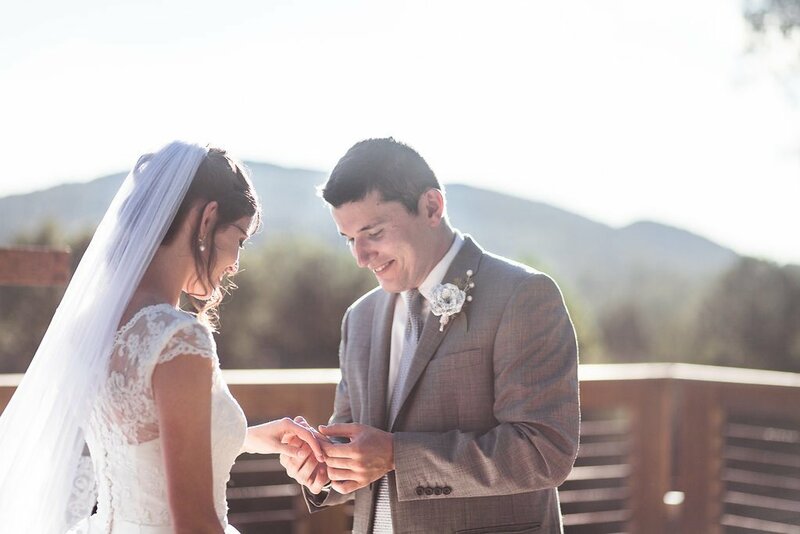 Check out my friend Renee’s brand new app – EverlyWed. 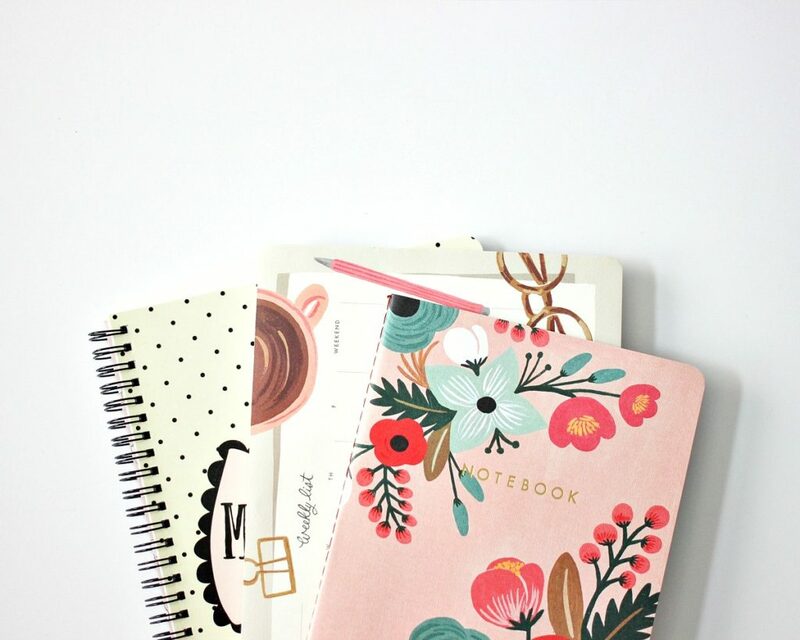 It’s everything you’ve ever needed as a bride to keep track of #allthethings. In one place, you can manage wedding to-do lists, bridal shower prep, bachelorette party planning, and even honeymoon details. Best part? Not only is it like, really pretty, but it’s totally free! Get organized here. 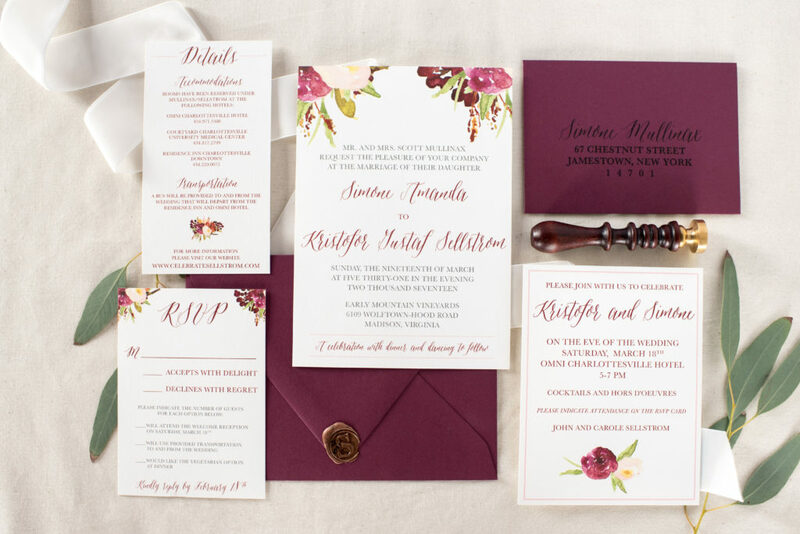 Need some pretty paper for your big day? 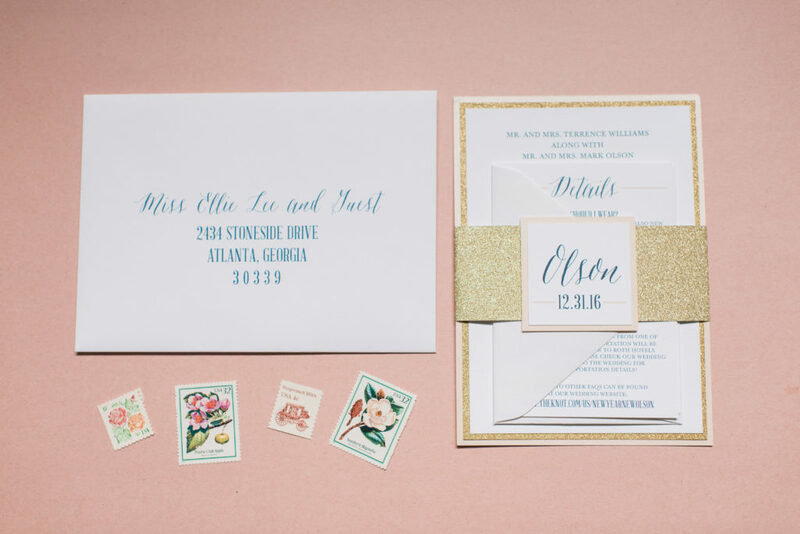 I’d love to be your wedding invitation Fairy Godmother! Download my Information Guide for all answers to all things stationery – inspiration, details about the process and costs, and answers to brides most frequently asked questions! You’re engaged, now what? Time to start wedding planning! It’s mid January, meaning many girlfriends have recently upgraded to the new title of fiancé. December is the most popular month of the year for proposals, which shouldn’t be surprising since it’s a time focused on family and celebrating. After the fantasy of an engagement begins to become reality, it’s time to start thinking about planning a wedding! But, where the heck do you even start? It can be extremely overwhelming to think about all the things! First things first – set a budget. A lot of the stress that comes with wedding planning is related to money. By setting a budget from the beginning, you’ll be able to make decisions without too much emotion. I recommend picking 2-3 things that are most important to you and allocating more of your budget there. For instance, maybe you really want a lot of flowers but feel fine about skipping videography. Or maybe you’re set on booking a popular, live band but aren’t worried about impressing guests with an extravagant food menu. Everyone is different, so decide what things are most important to you and your fiancé. 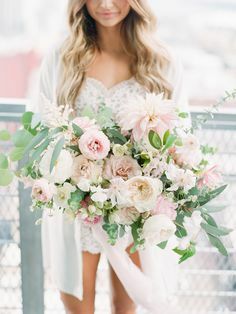 If you’re the type who has been pinning everything wedding related for the last two years, it’s time to edit and trim your inspiration. You can even start a new board and pin your favorites there. It’s easy to collect a lot of ideas over time and looking at it all together can easily get overwhelming. Make sure to only keep pins that directly relate to the theme and feeling you’ve set. It’s 100% ok if you haven’t even thought about wedding colors, themes, or inspiration before getting engaged. The fun starts now – Pinterest is a wonderful resource to use. You can use the search function to get started and save your favorite ideas to a board. This is helpful for you to stay on track as well as provide visuals to your wedding vendors! Once you choose the “where” and “when” the other parts of your big day will start to fall in place. 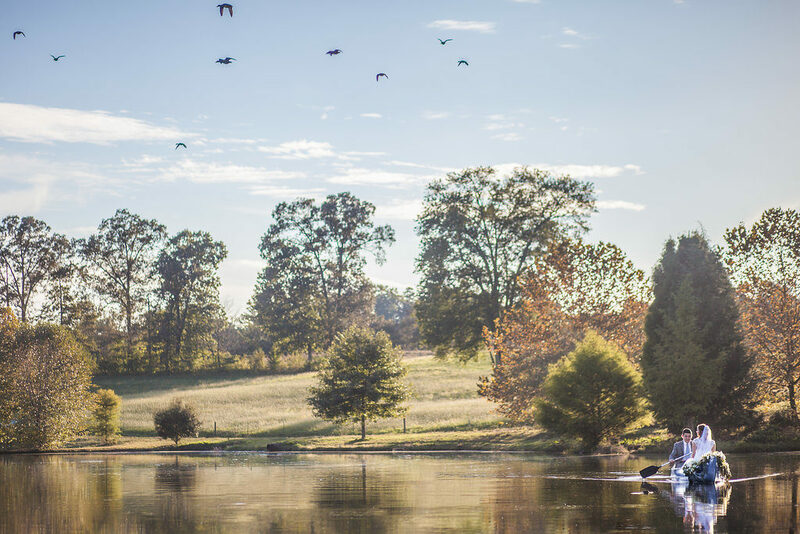 There’s a lot to consider when deciding the venue – like how many guests a space can hold, if they allow outside vendors or supply a team, what amenities are included, and if it makes sense logistically. I really love The Venue Report website for browsing through awesome wedding locations. You can search for exactly what you’re looking for and it will provide you with options, information, and photos. Your venue is the backdrop of your theme and will set the tone for overall feel of the entire wedding. After you’ve booked a venue and picked your date (aka your future anniversary!) it’s time to start selecting your wedding vendors. Once again, there are a lot of factors to consider and lots of amazing options – these decisions can be very difficult! A good place to start when looking for vendors is through the wedding venue itself. Often, they can provide a list of recommended professionals. Once you book with a vendor, they are happy to give you referrals of people they trust and enjoy working with. Make sure to check out their websites and social media for portfolios of past work to ensure it fits with your theme! 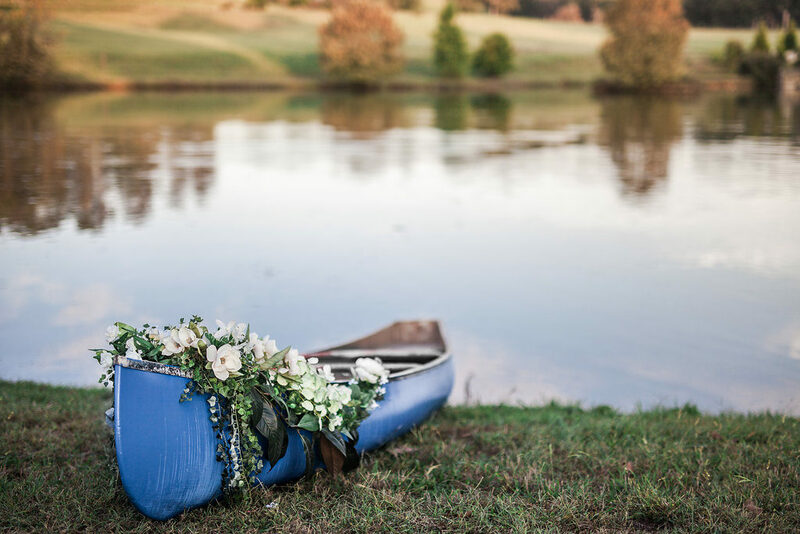 Depending on your personality – this can be this most enjoyable or daunting part of the wedding planning process! In my opinion, the details are what really set apart your day from everyone elses. 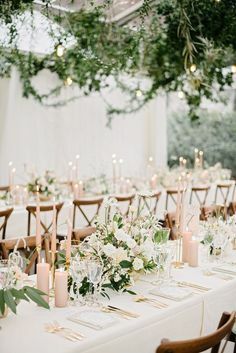 You can choose unique touches in different ways to represent you as a couple – decor, food and drink, entertainment, design, favors, the list goes on! 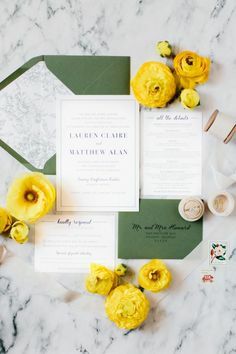 Your wedding invitations set the initial tone for the entire event and I recommend putting a lot of thought into the design. Imagine a reaction of your guests opening the envelope – how do they feel, what do they say? Subconsciously, it even leads guests to dress a certain way and even how much to spend on a wedding gift! Yes, seriously. 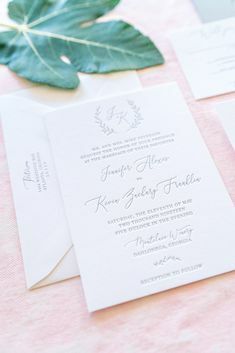 An invitation printed on thick cardstock in a luxe envelope with a liner is going to give a different impression than a casual design on everyday paper. Consider sending save the date cards about six months prior to the wedding date. 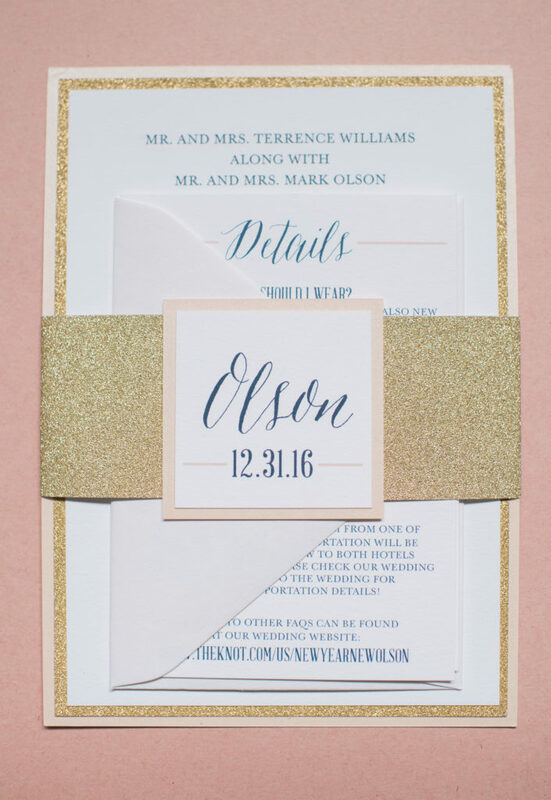 Wondering what save the dates are and if you really need to send them? Check out this post for all the details on this piece of wedding stationery. I put together a wedding planning timeline specific to all things paper here! Find out exactly when to order save the dates, mail invitations, and send thank you cards after the wedding. Questions about wedding planning, timelines, or getting the process started? Comment below! 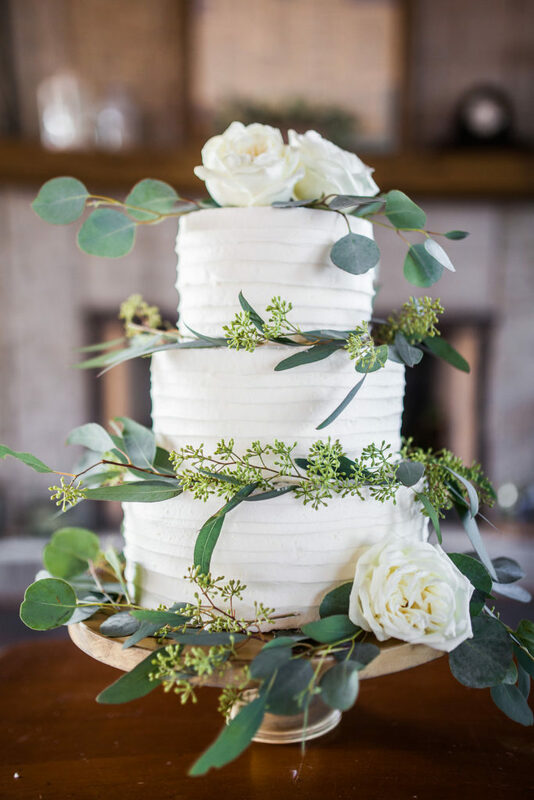 I don’t think this North Georgia mountain, dusty blue themed wedding styled shoot could have turned out more beautifully! 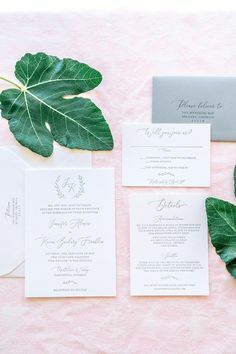 Brianna of Brianna Joseph Photography had such a gorgeous vision and executed it perfectly – I was so excited to be involved by creating the invitation suite. 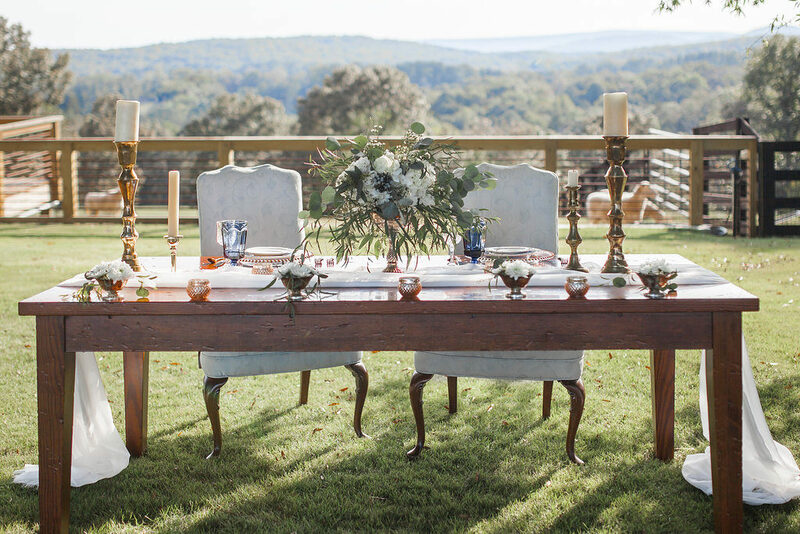 Lewallan Farms, a wedding venue in Waleska, Georgia, was the backdrop for the shoot. 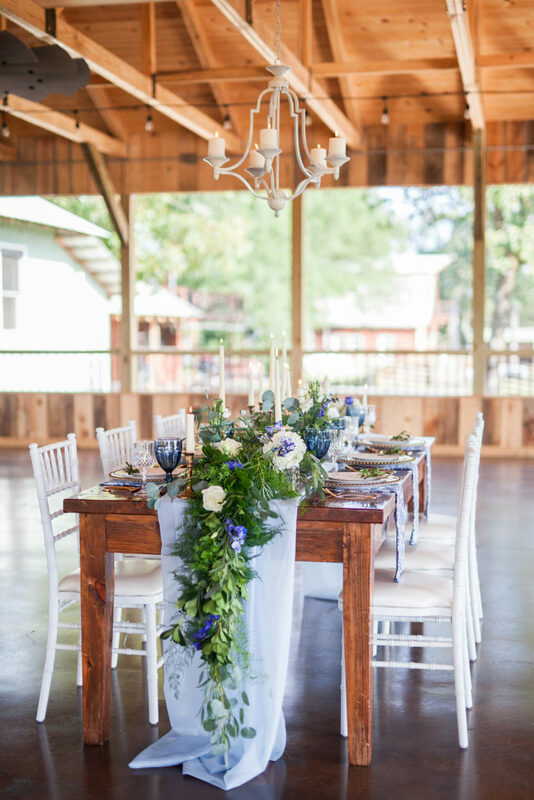 The farm is 400 acres and boasts multiple ceremony sites. The land is complete with a lake and stunning mountain view! 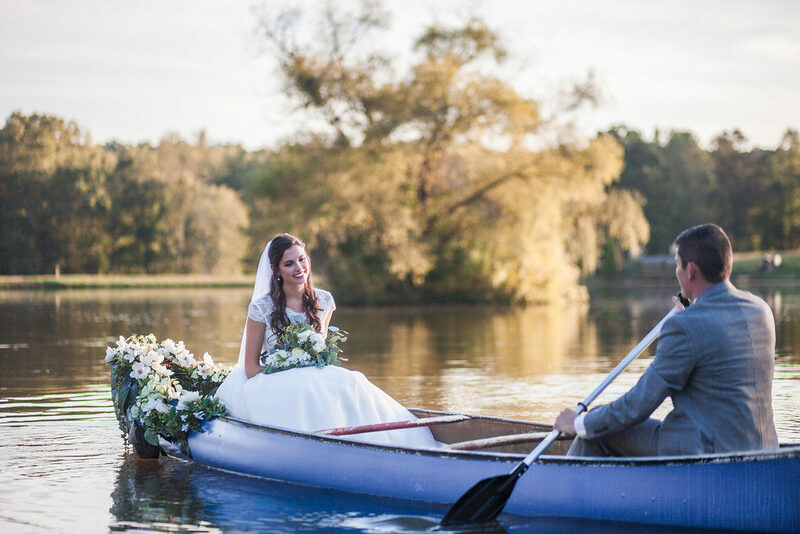 Brianna used the vintage blue canoe as a starting point for the overall concept and brought together an incredible team of local vendors to create a picture-perfect day! Every detail was so well thought out and the special touches really shine. See full vendor list with links at the bottom of this post. 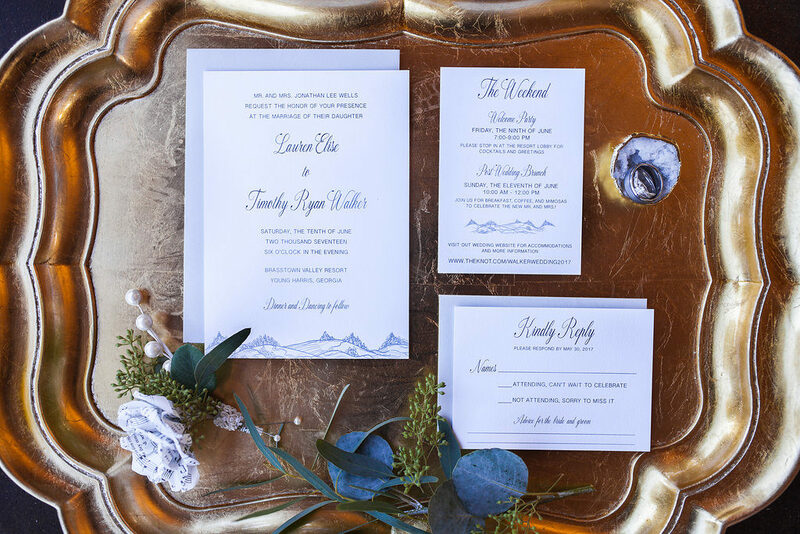 The mountain themed stationery suite included rolling hills and elegant fonts. This design is a personal favorite and is simple, classic but versatile enough to fit a more modern outdoor wedding style. 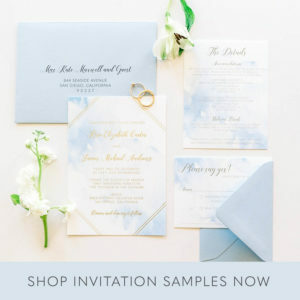 Dusty blue weddings are right on trend for 2018 and these envelopes are a great way to incorporate color in your wedding invitations. Interested in using this design for your wedding invitations? Order a sample or contact me here! I know, I know – it’s entirely too early to start thinking about the holidays. Truthfully, October is quickly wrapping up meaning the time to think about the end of the year is upon us! If you want your holiday cards to go out in early December, it’s not too early to order. So hop over to the holiday section of my Etsy shop or select a design by clicking “order now” below. All wording is customizable, just include your details during checkout. After purchase, email your high-quality photo and I’ll provide a proof so that you can review and make changes before printing. Your order will ship 5-7 business days after proof approval. Have something different in mind? I would love to use your photo (or wedding invitation!) as inspiration to create a fun design. Get in touch with me soon and let me know what you’re thinking – I’ll take a limited number of custom designs this season. The big day has come and gone, but there’s still one wedding to-do left on the list! It’s time to write thank you notes to all the people who contributed to your wedding – either by helping, attending, or contributing in some way. In a world of text messages and emails, the lost art of writing a letter has been forgotten by many. However, I really think that the value of receiving a handwritten thank you note really shows the thought of a genuine appreciation. The biggest list of people to thank are those who gave a gift before, on, or after your wedding day. 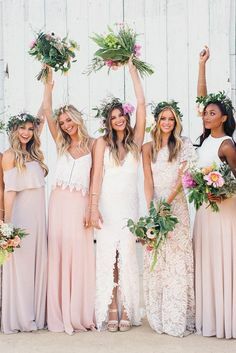 You should also include anyone who helped make your big day possible – your bridal party, family who helped contribute financially, and vendors that rocked your socks off. Keep a list of everyone you intend to thank and exactly what you will thank them for – use an Excel spreadsheet or Google doc to keep everything super organized. Per Emily Post etiquette, wedding thank you cards should be sent within three months of the recipient of the gift. 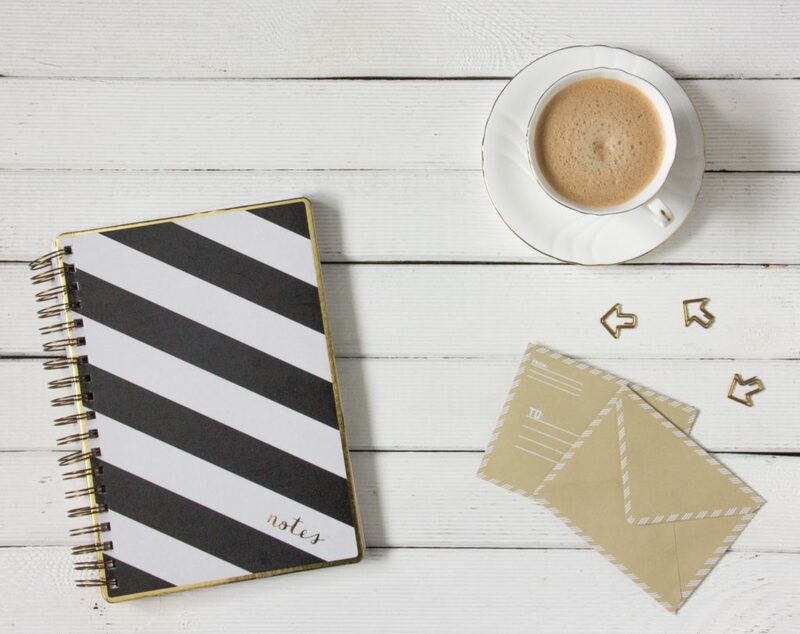 Often, things can be pretty busy right after a wedding – honeymoons, moving, adjusting to newlywed life, so schedule a time each week to sit down and write a few thank you notes at a time. It can seem daunting to do them all at once (and hello, hand cramp!) but breaking them into chunks will help tremendously! As a former second grade teacher, I’m happy to break down the how to of writing your wedding thank you cards. Make sure the notes are personalized to each recipient and include their names. Thank them specifically for being a part of your wedding and how they helped make your big day special. Make reference to the actual gift that they gave and include how it might be used. Feel free to get as funny and creative as you like, but generally 3-4 sentences should get the job done. We are so glad that you were able to be a part of our big day – it wouldn’t have been the same without you there! Your gift was very generous and we are putting the money toward new living room furniture in our home. You’ll have to come check it out next time you’re in town! The idea of incorporating one of your wedding photos with the thank you card is always fun! I offer wedding thank you postcards here in my Etsy shop. I can also create a custom design to match your oh my! 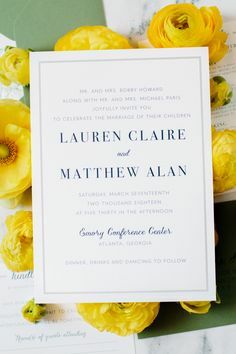 designs invitations. 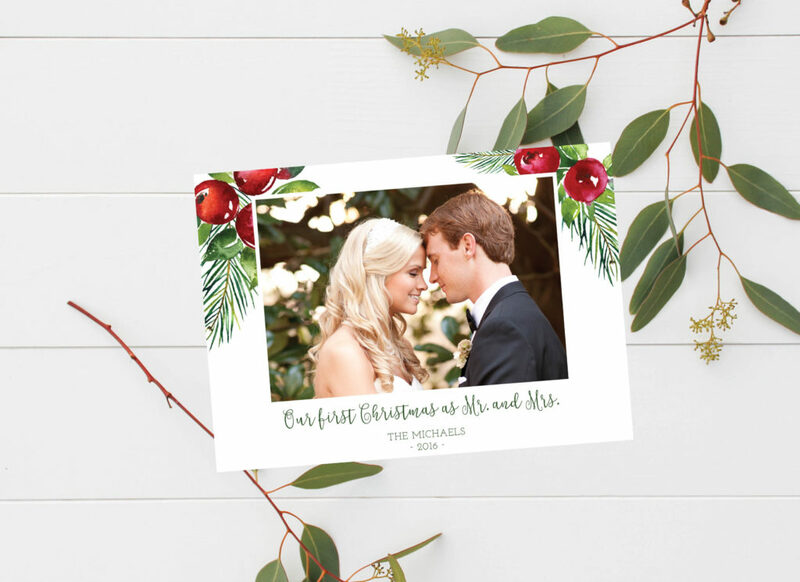 These are perfect because you can show off a picture on the front and include some text (typically “thank you”, the wedding date, and your names). On the back, you’ll be able to handwrite a short note in the blank space and drop in the mail! Want to keep it a little more traditional? Opt for thank you cards, flat or folded, with envelopes. Include your new monogram or last name with a simple design. The great thing about this option is that you can use these cards for years to come since they won’t be wedding specific! 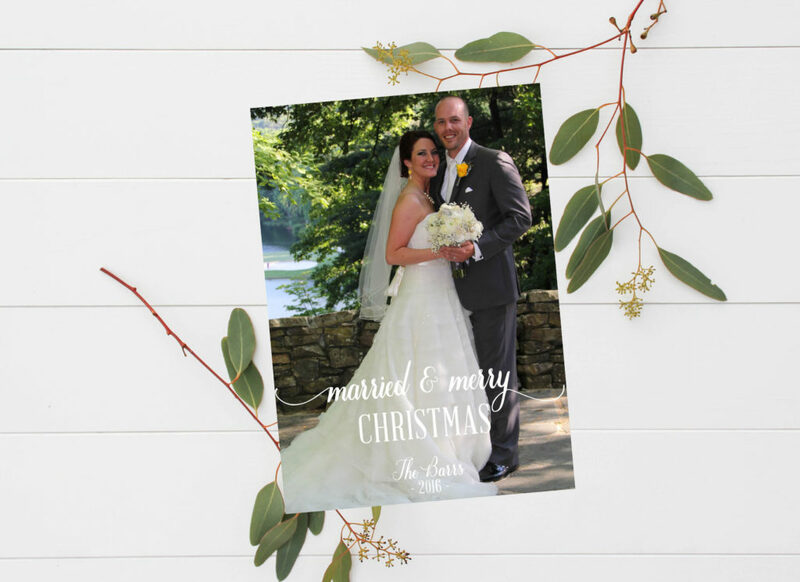 Ready to order your wedding thank you cards? Send me a message here! August is quickly coming to a close, which means fall will be here before we know it. 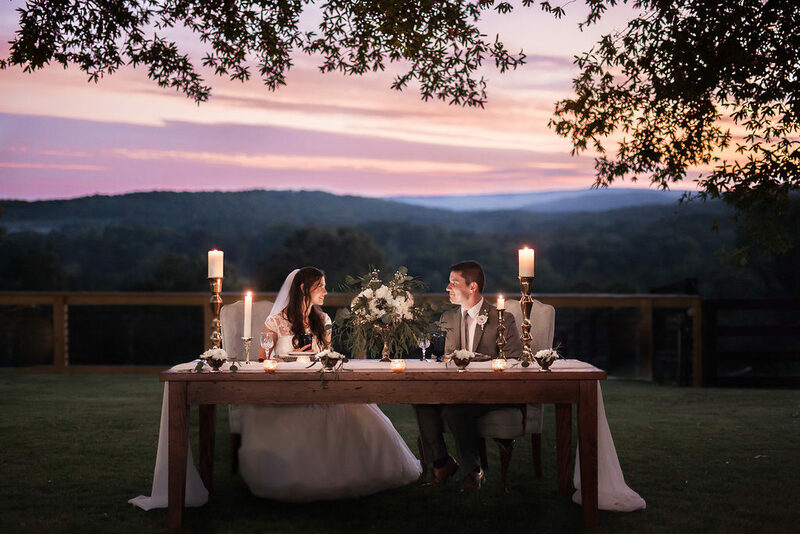 Planning a New Year’s Eve wedding? Now is the time to order your invitations, if you can believe it! I’ve been meaning to share this “pretty and witty” suite for a while (like almost nine months now) and I’m finally getting around to it. Courtney and Mike met at a New Year’s Eve party and got engaged on New Year’s Eve a few years later. It only seemed appropriate that they planned their wedding for this day! Courtney has great style, so I was honored that she chose to work with me for their wedding invitations. She had a super clear vision and we customized one of my existing suites to fit her theme – glam, glitter, and sass. Navy was incorporated with the printing and the invitation was mounted on a gold glitter mat with a metallic soft blush backing. The gold glitter bellyband completed the suite and held everything together nicely, finished off with an outer square of the soon-to-be couple’s new last name and (very fabulous) wedding date. At first glance, you’ll notice how beautifully the suited turned out to be – I think this one knocked it out of the park. I only wish I could see the expressions on guests’ faces as they opened this gorgeous little package. Once you get a chance to read the insert cards, you realize the sassiness that the couple incorporated using hilarious wording. I mean, check out this RSVP card! When a couple doesn’t take their selves, or their wedding, too seriously it makes it a little more fun for everyone. 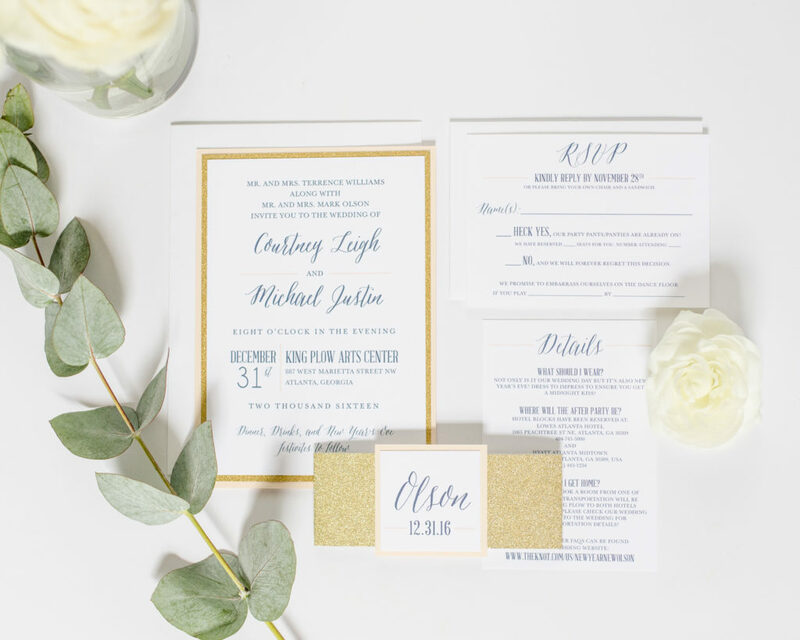 These wedding invitations truly set the tone for Courtney and Mike’s glamorous, fun big day and were a great representation of them expressing their creativity. Interested in using these invitations for your own wedding or want to work together to create something a little different? Fill out my questionnaire here to get started! 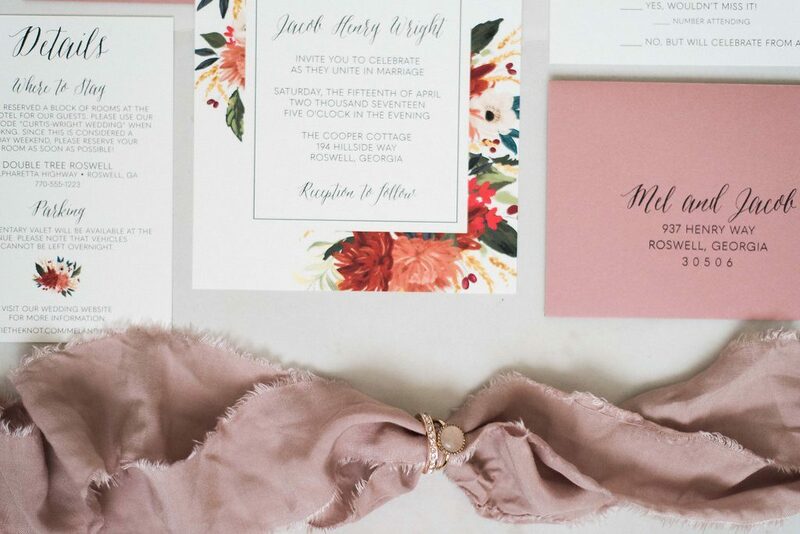 What do you do with your wedding invitations after the big day is over? Your wedding invitation is one of the only things you actually get to keep from your wedding day. If you’ve been hanging around the site, or me, long at all, you’ve likely heard this from me before. 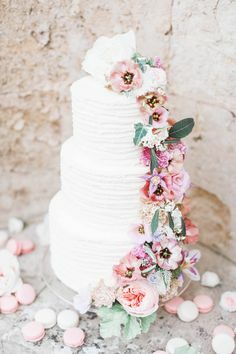 After the flowers have wilted, the music has played, and the cake has been eaten, you’re left with your dress, photographs, and a piece of paper reminding you of all the memories of one of your most special days. As a true keepsake, find a way to display the invitation in your home rather than just throwing it in a drawer. 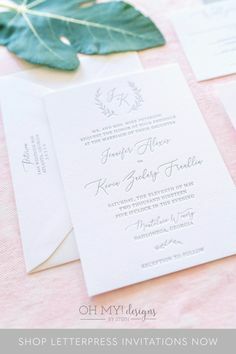 There are so many fun and unique ways to use your wedding invitation once the big day has passed! The easiest way to display your wedding invitation after the big day is by framing it or creating a shadow box. I love the simplicity of putting the paper in a pretty frame that matches your home decor and putting it somewhere you’ll see it daily. Hang it in your bedroom so it’s one of the first things you see when you wake up and before you go to sleep or in a common area as a conversation starter. If you want to pair some other wedding day details with the invitation, consider creating a shadow box. 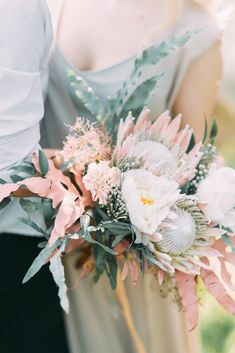 You can include things like dried flowers from the wedding bouquet, the garter, and the cork from the champagne bottle you drank as newlyweds. There’s no shortage of ideas on Pinterest for wedding shadow boxes! Recently a former bride told me that her mother had their wedding invitation made into an engraved plate. I thought this was so neat! A local boutique handled this project, but there are also sources online who will recreate the design and have it engraved on sterling silver or pewter. 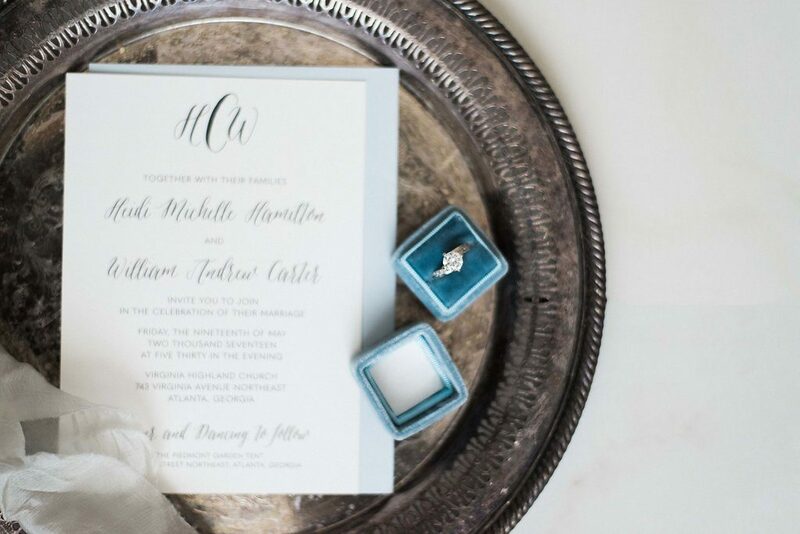 Along with plates, you can have the invitation engraved on a tray or glass – beautiful to display in your home! Until I began researching for this post, I had no idea people were turning their wedding invitation designs into pillows! 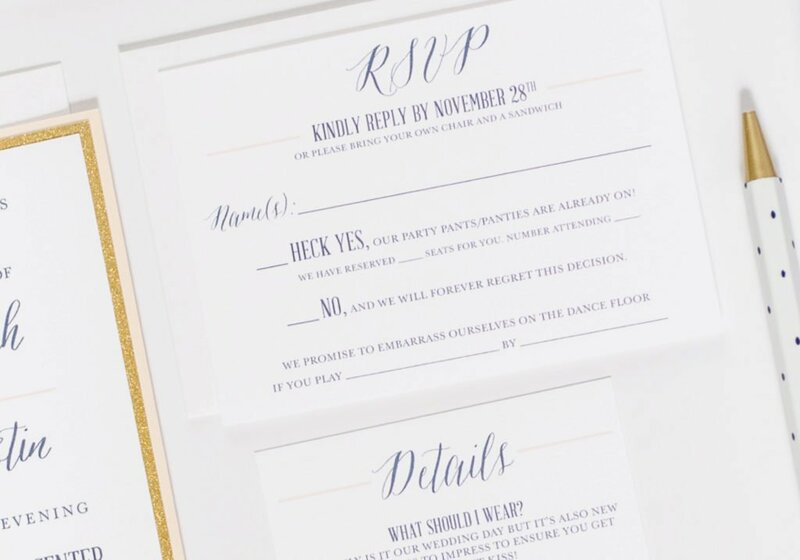 When I stumbled across this Etsy shop, I thought it was the cutest idea and a really unique way to preserve your invitation. Having your invitation on a handmade pillow is both a great way to decorate and keep your design alive! 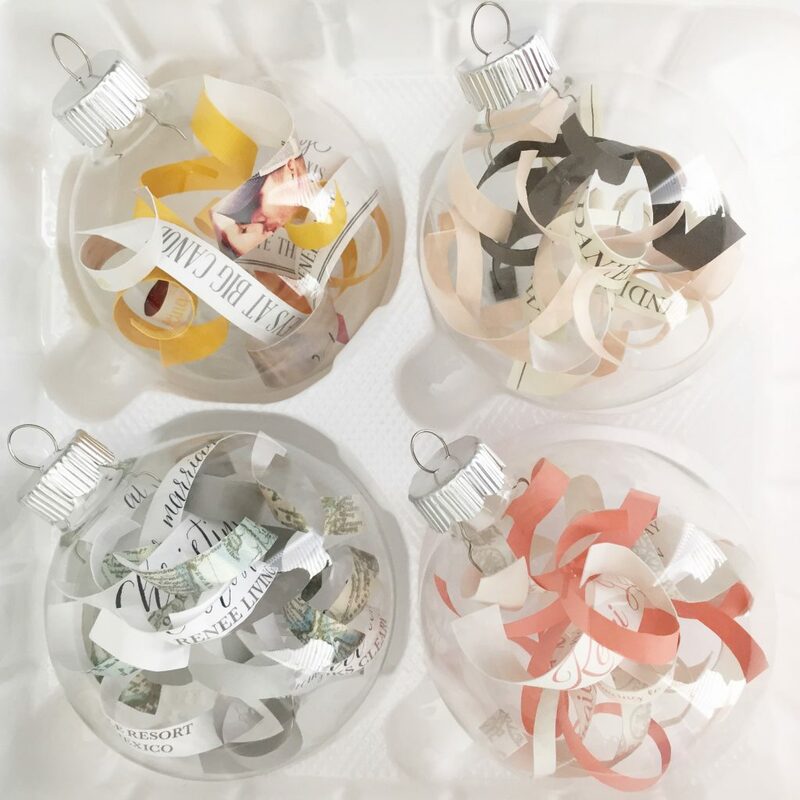 One of my favorite ways to turn your wedding invitation into a fun keepsake is to create an ornament for the Christmas tree. It’s super easy to do and you can read my full step-by-step tutorial here. This is something you can do yourself, but I also love this idea to give as a gift to a newlywed couple for their first married Christmas. There are so many options of ways to display your wedding invitation, which is your favorite? When ordering, remember to include a few extra to use as keepsakes for yourself and your family members!